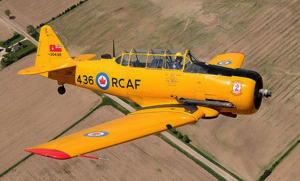 While based at Moose Jaw, 20436 was one of the Harvards used in the Goldilocks Aerobatic Team. It was bought by Percy Ellard of Caron, Saskatchewan in 1968 and registered as CF-WWI. It was later owned by Robert Wilkinson of Calgary, Alberta and purchased in 1988 by William E. Lamon of Eugene, Oregon, an ex-NATO pilot trainee from Belgium who trained on Harvards in Canada. It received the US registration N436WL. In recent years, the aircraft was a part of the Canadian Air Force Heritage Flight, flying in formation with a CT-133 Silver Star and CT-114 Tutor. It is also an honourary member of “The Big 2” (#2 Canadian Forces Flying Training School) in Moose Jaw. CHAA acquired the aircraft in January 2008 and it was flown from Oregon to London on April 15-17, 2008, a distance of 2130.5 nautical miles. On April 19, 2008, 20436 flew from London to Tillsonburg Airport escorted by C-FWPK and C-FRZW. It was re-registered in Canada as C-FWLH which we know stands for William Lamon’s Harvard.